2018 18 VOLKSWAGEN TRANSPORTER T32 TDI KOMBI HIGHLINE DSG (AUTO) GEARBOX 150 BLUEMOTION EURO 6 CARPETED HIGH SPEC KOMBI! This Short wheelbase Kombi comes with a DSG (Auto) Gearbox and one owner. It is in very good condition and is HIGHLINE van in Reflex Silver. 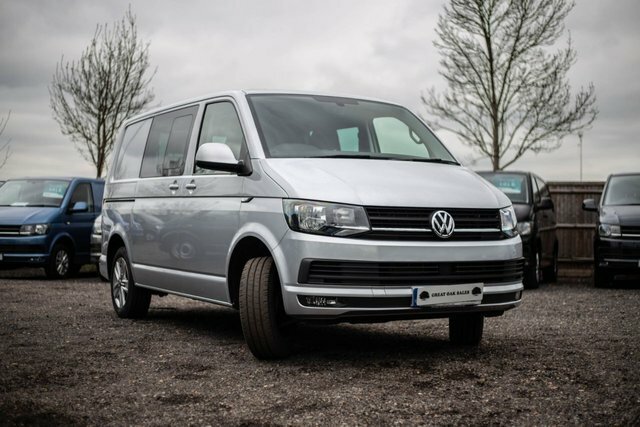 In addition it also comes with: Comfort Dash, Cab Carpet, Twin Sliding Doors with Soft Close Finish, 2+1 Seats, Rear Tailgate with Power Close Finish, Composition Media with a 6" Touch Screen, Three Tone Carpeting to the Rear and Roof Lining. Questions? Give us a call: 01932 765909.